My wife likes to read. A lot. No, I don't think you understand. She owns over 300 books. She read the new Harry Potter book cover-to-cover in less than 6 hours the day it came out. That would be 784 pages. 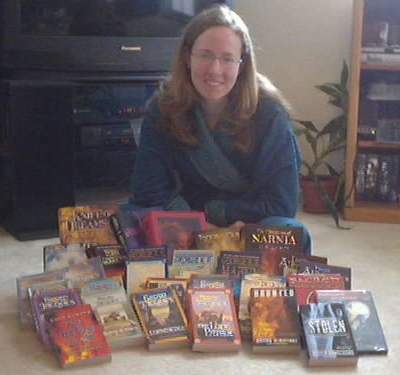 Here she is Christmas day 2005 with 26 books. She finished all but one by June. She's holding off on the last one until Robert Jordan finishes his series. The reason I mention this is because of the gift she got from my ma, Evil Mom Beast, for her birthday this year. 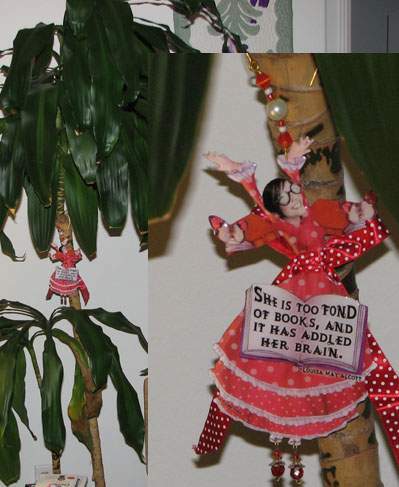 It's hanging on a tree next to the dining room table. See ma? She DOES like it!